Modern Rustic Kitchen Decor at Butcher Block Co.
Rustic meets modern at Butcher Block Co.! Modern rustic decor is very popular right now. It is often exemplified by a mix of natural materials including stone, wood and metal. In a kitchen this could be a combination of granite countertops, a wood farmhouse table or island top, and stainless steel appliances. See a variety of ways the charm of natural wood can make your modern rustic kitchen warm and welcoming. You can make your own farmhouse table, island top or countertop by ordering a Butcher Block Co. brand edge grain or plank-style wood top. They are available in 15 different species of wood and a handful of finish options. Choose a hand scraped finish if you are looking for a more authentic distressed top. Country style is definitely going urban! The addition of a country-style table in your kitchen is a simple way to go modern rustic. Consider a country work table with a painted base, available in dozens of sizes, colors and features. John Boos recently introduced their Rustic Country Table which features an Ash wood butcher block top. It incorporates numerous attributes that collectively convey a classic rustic character. Most striking is the tables top’s embossed texture that enhances its authentic and aged appearance. With a caramel colored stain, this table serves as a great accent piece in a modern rustic kitchen. Bring the outdoors into your home with a live edge wood slab. These authentic wood pieces can be transformed into a modern rustic countertop, kitchen island top, dining table, bench and more. Available in a variety of wood species and sizes, you are sure to find the perfect piece for your project. And for a limited time, we’re so certain you will love your live-edge slab we are offering a 30-Day No-Risk Trial. If you aren’t totally satisfied we will absorb the return shipping cost and waive the typical restocking fee, so you have absolutely nothing to lose! The kitchen is often the the family gathering place and a butcher block island is the entertainment center of the kitchen. Highly functional, kitchen islands are great for prepping food as well as serving appetizers and eating meals. 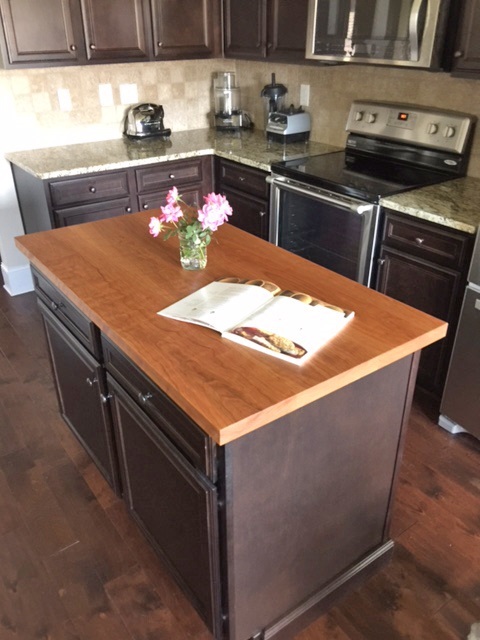 Butcher block island tops are available in custom sizes in end grain, edge grain, blended grain and plank-style wood. Select from 15 different wood species. Farmhouse sinks are all the rage, and John Boos butcher block countertops can be custom ordered from Butcher Block Co. with sink cutouts specifically for your apron sink, or for any top-mount or under-mount sink, for that matter. All we need is the model number of the sink and a drawing with countertop measurements. Yes, we can do cutouts for stove tops as well! We do a lot of custom countertops to meet very detailed specifications. To get started, give us a call at 877-845-5597 and we can help you determine the best butcher block configuration for your kitchen remodel. Elements like a rustic edge cutting board can add a vintage accent to your modern kitchen. The Boos 1887 Collection of cutting boards hearkens back to the company’s inaugural year. The very first Boos Blocks were cut from solid blocks of Sycamore wood. Like those originals, these boards feature rustic edges created by Nature – each one slightly different from the next. Available in small, medium and large sizes, in maple, walnut or cherry wood. If you’re going for a modern rustic look, or just want to add a little rustic charm, Butcher Block Co. has what you need! We hope you’ve been inspired to bring some natural elements into your home. We are so inspired by the creativity of our DIY customers, that we wanted to share some of their work with you. We have recently received several photos of incredible DIY projects from some very handy customers. We hope you are moved to think outside the box and re-purpose something you already own, or even build something from scratch to make your own custom creation! We can help you customize just about any size top to fit your exact needs. Check out these amazing projects to get your creative DIY juices flowing! Our DIY customer, Kaleb, designed and created the industrial style coffee table featured above. It is topped with a 4″ thick Maple End Grain Butcher Block. We love his mix of wood and steel, and the industrial style is certainly popular today. After his day job, Kaleb spends time in his workshop designing and building custom industrial style furniture and picture frames. “Making industrial furniture and construction is my release,” he says. “When you sit at a desk for 8 hours a day you need some sort of an artistic release…” Kaleb can build just about anything. His picture frames are large statement pieces usually 6 feet long. He uses wire rope, pad eyes, gears, chains, rivets, etc.. to give each piece an industrial feel. Check out this awesome portable island he made for his sister, which is a massive John Boos AA Block supported by the stainless steel frame he fashioned. Another happy customer, Karen, always wanted a long butcher block island in her kitchen, but could never find one that was long yet narrow enough for her space. 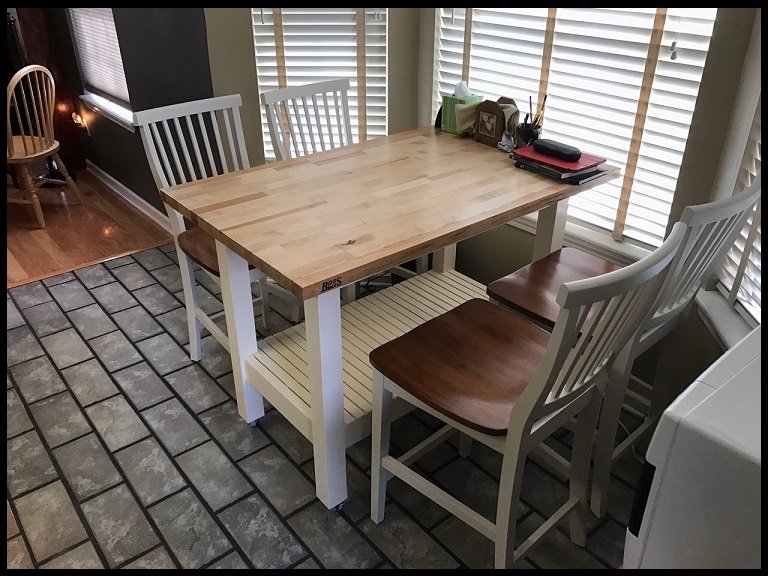 She did have an existing console table that fit perfectly in her Savannah kitchen, so she decided to do-it-herself and make her own custom island featuring a Butcher Block Co. Cherry End Grain top 73″L x 18″W. Nicely done, Karen. If you can’t find it, DIY! If you have created a custom DIY project with one of our blocks, we would love to see it! A DIY replacement of a top on something you already own is usually pretty easy, and is a great way to breathe new life into an old piece. If you are in the market to upgrade some existing furniture or create your own masterpiece, we hope you’ve been inspired by these truly awesome projects, and we hope to help you along on your creative journey. No other business in the small town of Effingham, Illinois (population: 12,500) has been in operation longer than John Boos & Co. Founded in 1887, the company manufactures kitchen furniture and equipment for residential and commercial use. They’re most famous for their eponymous butcher blocks, as well as countertops, islands, tables, carts and cutting boards made of butcher block. But soon, all these Boos wood products will be manufactured in a new facility. On December 15, the Effingham City Council will meet to consider selling to Boos a 15-acre parcel appraised at $300,000. It’s owned by the city and located near Boos’ corporate offices and modern metal plant situated at 3601 South Banker Street in Effingham. Production of stainless steel work tables, cabinets, sinks and shelving began there in 2011. According to Vic Jansen, Director of Manufacturing for Boos & Co., “The wood plant is located at 315 South First St., and the outlet store is located at 507 East Fayette Avenue. But after the move it would all be together, except being separated by Thies Avenue. First we’d like to get the land secured.” Boos expects to break ground on a 100,000 square-foot facility by spring; sooner if weather permits. John Boos butcher blocks and cutting boards are used daily by such celebrity chiefs as Mario Batali and Emeril Lagasse. They’re featured regularly on food and cooking-oriented channels, including The Food Network. Professional chefs also employ them at such famous restaurants as The Border Grill in Santa Monica and New Orleans’ Bayone Restaurant. The company’s factory outlet and showroom in Effingham is open to the public daily. Since 2006, Butcher Block Co. has been selling products designed for home and commercial kitchens. The company offers for sale butcher block cutting boards, carts, islands and tables, but is best known as a destination site for premium custom wood countertops. For more information please visit: http://johnboos.com and https://butcherblockco.com. Over the last several months, we have seen a substantial increase in orders of Walnut butcher block products. The popularity of Walnut butcher block has been growing steadily for years, but the recent sales indicate this trend has really taken off! So, what’s got people so excited about Walnut? To put it simply: it’s gorgeous! Walnut butcher block has the ability to look both modern and rustic, making it a versatile material that can be used in just about any room of your home. Whether you lean toward traditional country, sleek minimalism, or ornate details, Walnut butcher block can fit in beautifully with your style. Let’s start small with countertop cutting boards. A Walnut butcher block cutting board is not only functional, it adds a pop of color and style to your kitchen. Because of their good looks, Walnut cutting boards and chopping blocks also double nicely as serving boards. Can’t you just picture an array of fabulous cheeses laid out on one of these beauties? If you are looking for more prep space than a cutting board will provide, consider adding a stunning Walnut butcher block island or cart to your kitchen. This is a great way to bring in some warmth and usable space if you’re not quite ready to remodel the whole kitchen. A Walnut butcher block island, table, or cart will add a fine furniture look to your home. 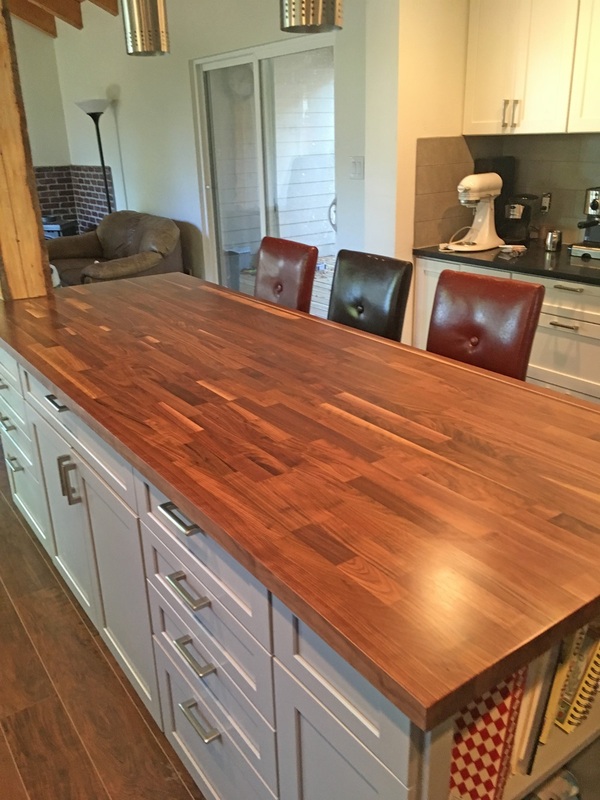 If you are ready to remodel the whole kitchen, or if you just want to update an existing island or countertop, we have Walnut butcher block countertops available in a wide variety of sizes, and can customize to your specific size or shape if needed. Available in End, Edge, and Blended Grains, you are sure to find a look that fits your personal style. With its rich beauty, Walnut butcher block also stuns in other rooms of your home, from the office to the laundry room. If you would like to squeeze a little Walnut into your life, check out our selection of beautiful products, or give us a call and let us know what you’re looking for. We are thrilled to offer such a gorgeous collection of Walnut butcher block pieces for your home. 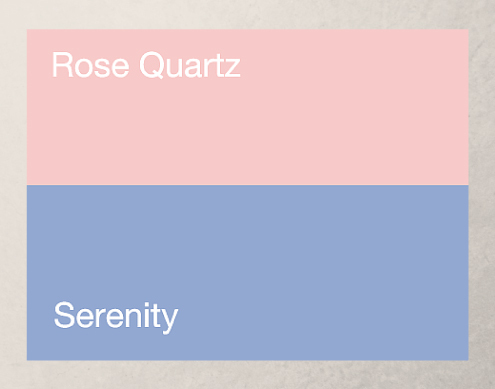 This is one trend that doesn’t seem to be going anywhere, so jump on board with us! Last week we talked about some of the cool custom projects we have worked on with our customers, so I thought it would be a good time to fill you in on just how to do a custom countertop project of your own. If you are in the market for a new custom countertop for any room of the house, we have a fairly simple process to get you from design to install. Your first step is to pick out your materials. We have a nice rundown of your options here, which explains the pros and cons of the different wood species and grain styles and what jobs each type works best for. If you’re having difficulty making a final decision, let us know and we’ll send out some samples for you. 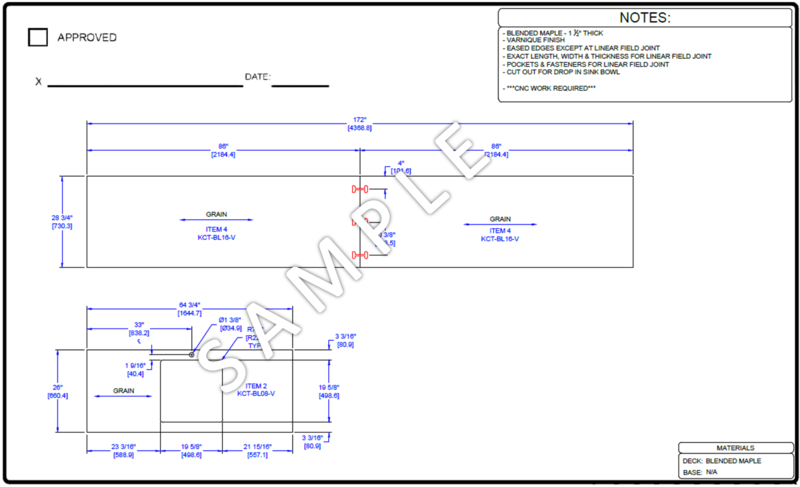 Once you have determined your materials, we need to see your layout and size requirements. You can send a simple sketch of your countertop needs to [email protected], detailing the dimensions and any cutouts. This can (should) be very basic; I don’t need your cabinet plans or blueprints from your contractor – just a simple sketch of the countertops. Because we can’t sit down together in-person, it’s important that I can see what you are visualizing; this occasionally manifests as a cell phone picture of a doodle on a napkin that is emailed to me while I am still on the phone with the customer, and that is perfectly okay! If you are unsure of the best layout for your space, send over what you have and we can talk it through. Sometimes we need to change things around a bit to accommodate extra-large sizes or unique shapes, and I review each project to make sure we are using the method that makes the most sense for design, installation, and budget. As you can see, we work with super simple hand-drawn sketches, professional images, and everything in between. We will price out your custom countertop project and send you a firm price quote. This can generally be done within about 24 hours, depending on how complicated your design is. Your quote will have a breakdown of the pricing if you have multiple pieces. After reviewing your quote and finalizing all your details, we can get your order processed and sent over to the Boos factory for manufacturing. I will need the details for any and all appliances, sinks, etc. that will be installed in your tops; you can email me the make and model number of each item. At this point, I create a drawing to send over to the engineering team at Boos, who will do all their fancy engineering stuff and work up an approval sketch for you to sign off on. This is the most important step in getting you the perfect custom countertops, so review the details thoroughly and have your contractor (if you are using one) verify all the specifications. If there are any issues, you just need to let me know and I will have them corrected. When everything looks perfect, sign your sketch and send it back to me. With your signed sketch on file, your order is put into the production queue at Boos and manufacturing can begin. And now you just need to wait. Custom countertops average about four weeks for production, so make sure you order far enough in advance. Nobody wants a kitchen without countertops! Once your countertops arrive, inspect them thoroughly and then allow them to acclimate for at least 72 hours in the room in which they will be installed. Installation is fairly straightforward and is often done by the homeowner without the aid of a contractor. Just make sure you follow these instructions properly. If at any point in this process you have questions, just let us know! We are here to help!